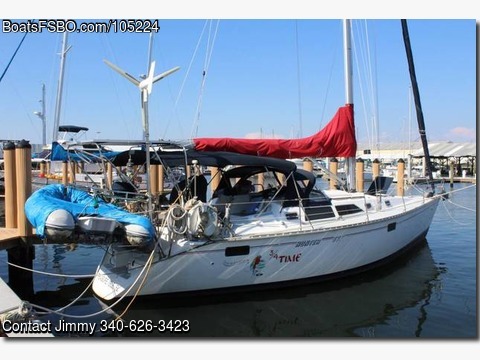 Contact the owner @ 340-626-3423 or captjadark@aol.com...Great liveaboard/cruising classic Hunter 37.5 in extremely great condition with all the bells and whistles needed for the cruising and blue water sailing lifestyle. Length 38ft., beam 13ft., draft 5ft. Amenities : New August 2018 bottom job and bottom paint. New 2014 Selden mast and Furlex furling system and all new standing and running rigging. Heavy dacron UK main and genoa sails in great condition. New 2011 1000watt Quick windlass with 150ft. 3B 5/16" chain braided to 250ft. 5/8" anchor rode with Delta 35 anchor and two additional Danforth and Fortress anchors. New 2015 Katydin/Pur 40E watermaker with new membrane and new O-rings. New 2010 15,000btu Cruiseair A/C Heat unit. New 2010 Xantrex Freedom 2000watt inverter/charger with remote readout at Nav. station. New 2011 Kiss Hi energy output wind generator. Electronics: Complete Raymarine wind, speed, depth, autohelm auto pilot w/hydraulic ram and pump, VHF radio, Grundig SSB, Kenwood 4 spkr. CD, Sirius ready system, Ocean marine davit system, Princess 3 burner stove, 12volt Seafrost freezer/fridge, 700 watt microwave, New 2010 Caribe L10 hardbottom dinghy, New 2015 18hp Tohatsu 2stroke outboard.